When you made the decision to become a patron of the Ostium Podcast, you were assigned a number, a door unique to you. There was a reason for that. It is possible that Ostium has not always been abandoned, not always population zero. Perhaps at one time there were people – from the future? The past? – who traveled through the doors of Ostium to different places in time and space to learn and educate and record their experiences. Perhaps these recordings are still in existence . . .
Do you have an Ostium File to tell? 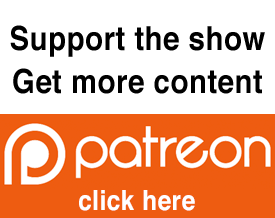 To get access to the Ostium Files and many other mini episodes and bonus content, support the Ostium Podcast via Patreon or through the Ostium website via Paypal and choose your support door wisely. When you have chosen your door, you will be assigned a unique door number, which will one day become your very own . . . Ostium File. Do you have an Ostium File in you? A short story you want to tell? One you’d like to have recorded and hear on the Ostium Files? Well you’re in luck. We’re now accepting submissions for Ostium Files. GUIDELINES: Must be between 1000-2000 words. Must not involve the main characters or ongoing plot of Ostium. SUBMISSIONS: Please email your submission to ostiumpodcast@gmail.com. If you would prefer to query an idea, or just let me know what you’d like to do and you’d appreciate my feedback, that would be totally fine. I’d recommend you letting me know in a sentence or two what your submission is about as you’re working on it, just in case it’s already been done. Though, chances are, you’re okay. I have no idea how many submissions I’m going to get, but if you’re story is good, I’ll do my best to get a voice actor for it, and get it made into an Ostium File. Looking forward to these amazing submissions and future Ostium Files . . .